'Eternal Russia' ('One Hundred Ages') - a painting by I. S. Glazunov. Finished by the author in Moscow in 1988. Originally called the 'One Hundred Ages', it was later renamed 'Eternal Russia'. I. Glazunov dedicated this picture to the 1000th anniversary of the Baptism of Rus, although the time frames of the events depicted by him were not limited to ten centuries, but led back thousands of years to the roots of the origin of Russian civilization. 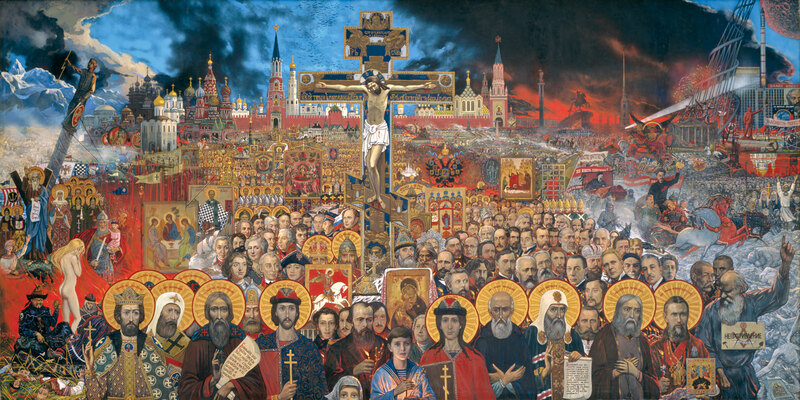 The artist presented the history of eternal Russia in the form of an endless national procession, religious procession, originating from Sophia of Constantinople and Kiev, the Church of the Intercession on the Nerl, the ancient walls of the Moscow Kremlin, at the beginning of which the images of Orthodox saints, statesmen and public figures, military leaders, writers, artists, scientists, composers who created, elevated and defended Russia.